Microsoft might close this loophole eventually, but for now, it seems to be working. If you want to get in on backwards compatibility right now, this method comes courtesy of Gamingbygamers on YouTube. It only seems to work with digitally purchases on Xbox 360. The steps are simple enough. If you have a friend that’s participating in the Xbox One preview program, you can use their profile to unlock the games on your own profile. First, navigate to the friends tab on the dashboard. Specifically, the “popular with friends” section. Then, click on the “...” button at the bottom, which takes you to a much bigger list. Scroll over until you find a friend who’s played a backwards compatible game. Then, click on the game. In this case, we’re looking at A World of Keflings. This allows you to pull up the proper store link that’s not available to regular users. Voila! Provided you already own a copy of the game, you’re good to go. 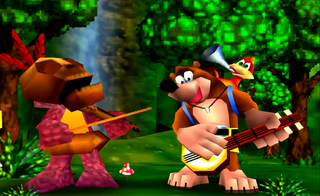 I tried this out myself, and it worked just for me on Banjo-Kazooie. Of course, since it’s a preview program, beware that it could crash. It’s rolling out to everyone else later this year, and Microsoft has promised lots more games will end up being compatible.